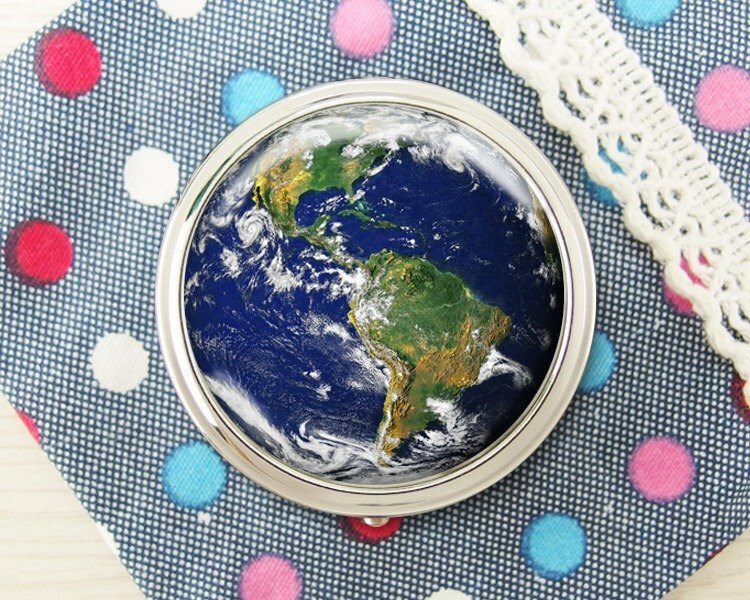 **This earth-shaped jewelry storage box is ideal for storing earrings, necklaces, hair accessories, rings, vitamins, candy, handicrafts, headphones, change and other delicate and cute things. The simple and practical storage box allows you to go out and not lose your favorite items. This versatile storage box has a built-in round mirror for easy access to the facade and your own looks, making you a geek. ** https://c2.staticflickr.com/6/5779/23512612680_dfa65d7bdd_b.jpg Earrings, necklaces, hair accessories, rings, handicrafts https://c2.staticflickr.com/2/1527/24090879270_19a20e5677_b.jpg Can put vitamins, candy, headphones, change, medicine https://c1.staticflickr.com/1/780/23808311995_50645ab65f_b.jpg Exquisite spiral pattern on the back. Built-in round mirror makes it easy to manage the facade and modify your appearance https://c1.staticflickr.com/1/669/23441064079_4651f84df8_b.jpg Anyone who buys a jewelry storage box will get a headset clip https://c2.staticflickr.com/2/1516/23368916014_479f123fe1_b.jpg Add purchases (1) Transparent hanging storage display stand - gift box - home decoration jewelry https://www.pinkoi.com/product/1AazxtYc More jewelry storage box style, please refer to the link below https://www.pinkoi.com/store/specialu?subcategory=299 ◆Metal sealed traction cover design, can be opened with a single push ◇ Sending the most touching gift, the taste of life is greatly improved ◆Super high plating texture, never fade ◇ Jewelry storage box with box or packaging yarn bag ◆Light and practical, no dust inside ❤ Stainless plating 材质 Material: iron plating, mirror, plastic 尺寸 Size: (diameter) about 50mm ❤ How to use: The illustrator surface of this product has been treated with special water resistance, but it is not completely waterproof. 保养 Maintenance method: If there is dirt, it is recommended to gently wipe the surface with a bright silver cloth or a clean rag. 产 Origin / manufacturing methods: Taiwan MIT assembly; Taiwan MIT exclusive design.